We are sincerely grateful for all the work the schools and the teachers do in preparing the young children of our parish in these important sacraments. They do tremendous work in helping children understand and appreciate these important days in their lives. We as a parish also have a number of Masses throughout the year in which the parents and children participate at the Mass. Our Communion Program is called “Grow in Love” and the Confirmation program is called “Confirming Our Children”. This is part of the preparation for our children in making these sacraments more meaningful in their lives. There is a meeting of all parents / guardians of children who wish to make these sacraments being held in Holy Cross Church, Tramore on Tuesday October 2. 2nd Class – for First Penance & First Holy Communion at 7pm. Application forms were distributed to the students for completion by the parents/guardians. We would ask you please to return the Application form to this meeting and NOT to the school. 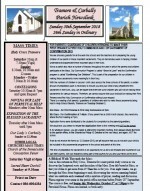 If, for whatever reason, you are unable to attend this important meeting, then please return the form to the parish office, in the Church by Friday 12 October at the very latest, and again, NOT the school. 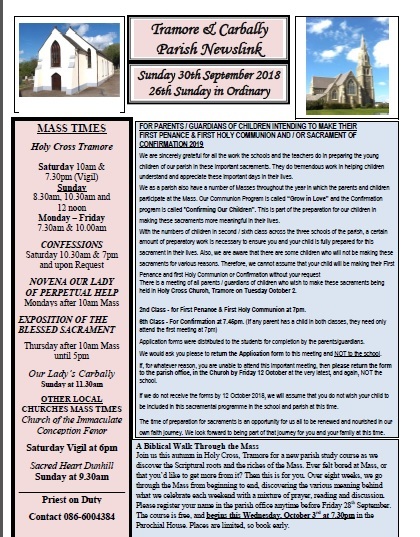 If we do not receive the forms by 12 October 2018, we will assume that you do not wish your child to be included in this sacramental programme in the school and parish at this time. The time of preparation for sacraments is an opportunity for us all to be renewed and nourished in our own faith journey. We look forward to being part of that journey for you and your family at this time.